Why do you need vibration isolators? A typical industrial or commercial workplace has an array of objects and machines that can cause unwanted vibration. Common examples are fans, motors and other machines that cause abnormal vibration levels during normal use. Aside from being a nuisance, there are other significant repercussions that could result from uncontrolled vibration levels. Vibration ControlIn order to prevent or control the vibration of any machine or equipment from affecting their surroundings, a vibration isolator is recommended as a more cost-effective solution. 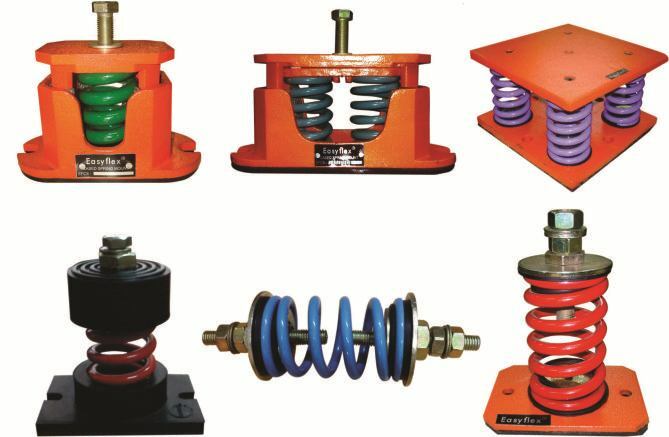 Vibration isolation is achieved by using special mounts designed to absorb the vibrations or movements caused by the machinery or equipment. Vibration absorbers are often made of rubber or dense foam. These materials are excellent in absorbing the unwanted movement of the machine or equipment. They can be custom-designed to fit specific machine or equipment in terms of shape, size and thickness. These special vibration mounts will not affect the function of the machine. They are easy to install and take very little space. 1 – Spring. These were one of the first isolators used and are still being used in some applications. Vibration is absorbed by the spring and then released in a different direction. 2 – Rubber. This was the second most used material for isolating vibrations. Like springs, rubber absorbs and releases the energy in a different direction. 3 – Oil. Some systems use oil but more like a vibration damper. Some of the movements in the system are absorbed. 4 – Foam and Polyurethane. These are the more recent materials used to isolate vibrations. These two materials can both isolate and dampen the vibrations. Foam however, breaks down easily and quickly. Polyurethane on the other hand does not have that much flexibility.